You’re adjusting to life as a new mum. Everything seems to be going well when you begin to notice increased hair fall. It could be extra strands of hair on your pillow or more loose strands during washing, which could progress to hair falling out in clumps. You may change your shampoo or try various hair tonics, but you start to panic about going bald. Firstly, do not worry – the above scenario is very common. There are many possible causes of hair loss, also known as alopecia. In postpartum hair loss, we are dealing with a very specific type of alopecia known as telogen effluvium, and it is one of the most common conditions treated by dermatologists. For most people, five to 15 per cent of the hair on the scalp is in telogen phase, meaning in the hair growth cycle, these hairs are in resting phase (not growing or falling out; see sidebar for more information). Telogen effluvium is triggered when a physiologic or hormonal change causes a large number of hairs to enter telogen at one time. Shedding does not occur until the new anagen hairs begin to grow, which usually takes two to three months. The emerging hairs help to force the resting hairs out of the follicle, which is why most people notice a sudden increase in hair fall a few months after delivery, or after an acute illness. The good news is that the prognosis is excellent and in almost all cases, recovery occurs within six months. Often, no specific treatment is required. Supplements are occasionally prescribed and in some cases topical therapy as well, taking into account whether you are breastfeeding or not. We generally advise patients to use a gentle shampoo and minimise activities that might result in excessive hair loss, such as rough combing and brushing of the hair, or tying it into very tight braids or buns. It is uncommon for hair loss associated with pregnancy to persist unless there are other medical issues involved such as iron deficiency or thyroid disorders. You should seek medical advice if the hair loss persists beyond six months. Therefore, the effect of normal or physiological hair fall is usually not too obvious because about 80 to 90 per cent of our scalp hairs are in the growing anagen phase at any given moment. 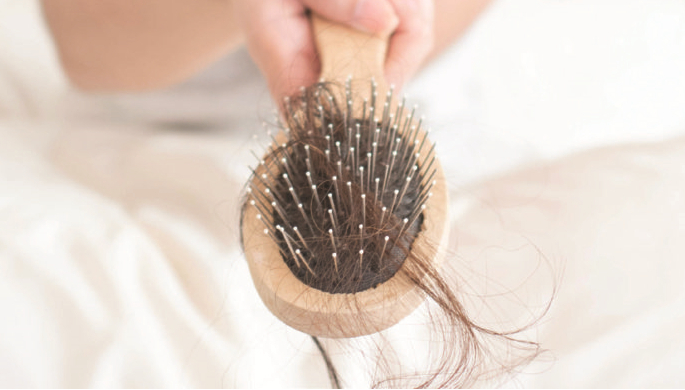 Thus, it is normal for a person to lose as many as 50 to 100 strands of hair daily, and these usually show up on a comb, brush or on the bathroom floor, especially after washing your hair.